How does PigmentOff-remover work? Differences to the laser removal. 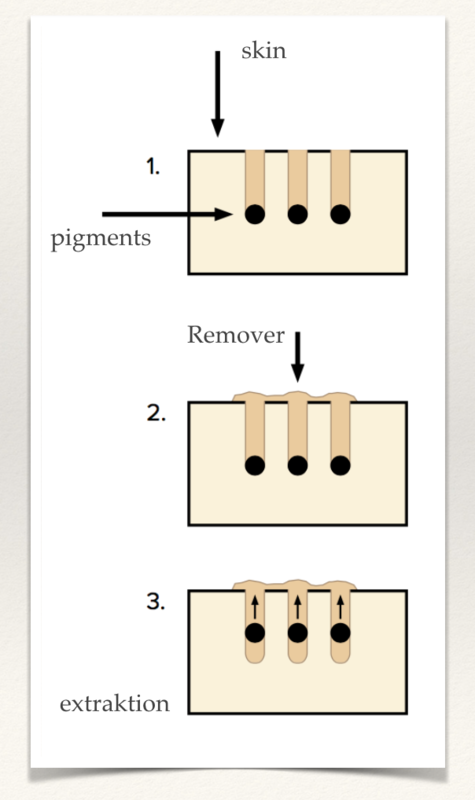 The removal technique of pigments with “Pigment-Off”-Remover is fundamentally different from a laser removal treatment. It is based on a unique chemical process, which aims at the extraction of implanted pigments from the skin and not on their splintering (as with laser). The pigments leave the body over the skin surface and not over the lymphatics. mical composition, which means a certain kinship of the elements and their good miscibility. In case of direct physical contact of “Pigment-Off”-Remover with the pigments in the skin, their constituents are mixed together. In contrast to pigments, the “Pigment-Off”-Remover ingredients can not manifest in the skin. They are always repelled and take the attached pigments simply with them to the skin surface. If the permanent make-up pigments have only been implanted superficially into the skin, one can remove the pigmentation even with a single“Pigment-Off”-Remover treatment! The success rate for the complete pigment removal with professional use of “Pigment-Off”-Remover is 99.9%. However, there are some peculiarities in removing tattoos. The particle size of tattoo pigments is different from that of permanent make-up pigments, so the removal of tattoos can be logically more lengthy than Permanent MakeUp. In addition, tattoo pigments are deeply implanted in body tattooing as pigmentations on the face. After the removal procedure, it is very important to maintain the treated skin area correctly and regularly. 50% of the treatment success depends on the following care instructions. After the treatment the removal process continues: a light crust is formed on the treated zone, and a good portion of the pigments are removed together with it. To remove pigments from the skin, “Pigment-Off”-Remover particles must have direct physical contact with implanted pigments. Therefore, when removing body tattoos, the remover liquid must be implanted deeper into the skin as while removing Permanant MakeUp. The extraction process becomes more complicated, a deeper puncture may result in scar formation (as a result of study, the scarring rate after removal of body tattoos was about 6%). Fortunately, we developed a prudent multi-session removal system. Following this system for removal of body tatoos, the scarring risk rate becomes <1%. This is a big step forward in the area of pigment removal since most customers are afraid of the risk of scarring and therefore do not want to remove the unsightly tattoos and failed pigmentations. The age of the tattoo / pigmentation does not matter for the removal with “Pigment-Off”-Remover. The unique properties of the “Pigment-Off”-Remover make it possible to remove pigments even immediately after pigmentation (immediately after permanent make-up or tattoo treatment). This is e.g. in the case of possible distortions.